It’s the end of March. Yes, it’s nearly April, already. We are not far off Easter and my Fox boys have spent there first month together. 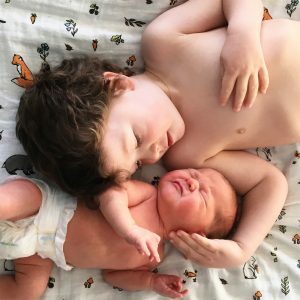 Their first month together has seen Alfie and Eli meet. It was quite possibly one of my all time favourite moments. If I could replay it over and over I would do. My heart melted. 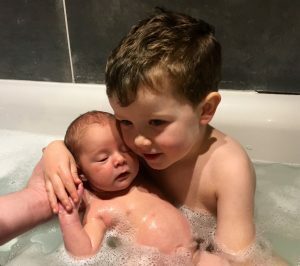 Alfie has really taken being a big brother in his stride. He shows so much love to Eli. He would kiss and cuddle him all day. Plus, he is always saying “You’re so cute!”. I mean, I have to agree with him! Eli is just as smitten with Alfie it would seem. He is the one person that can really hold his attention, even at such a young age. The way he stares at him and follows him as he moves is lovely. We are sure that Alfie will be the first to get smiles from Eli. It’s not always so adorable though. Eli cries, as all babies do. Alfie doesn’t like babies that cry. He is heard to be saying “Eli’s screaming” even if he’s just making a few noises! It is rather amusing that when Alfie is giving Eli a cuddle and he starts to cry, he pulls a silly face and says “Get him off me, take him away!” whilst trying to push him off. I shouldn’t laugh but it’s funny! 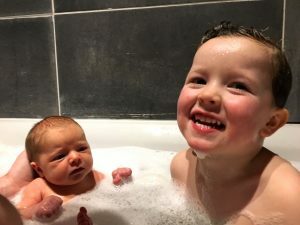 This month has seen them have their first bath together. It was an experience that’s for sure… Alfie is dangerous with bath toys and a jug! But he is very good at helping and wanting to use the sponge to clean him. I can’t say I expect that to last! The Easter holidays are not far away and I’m excited to see Alfie and Eli together a bit more!